As announced, back in February at Toy Fair 2014, the final figures in Mattel’s long running 6″, Four Horsemen sculpted, DC Universe Classics line will be a series of tributes to the 30th anniversary of Kenner’s beloved DC Comics ‘Super Powers’ 3.75″ action figures. Mattel is repainting 6 figures (including a collect-and-connect figure) and giving us one last new mini-figure sculpt as a “thank you” to the fans. 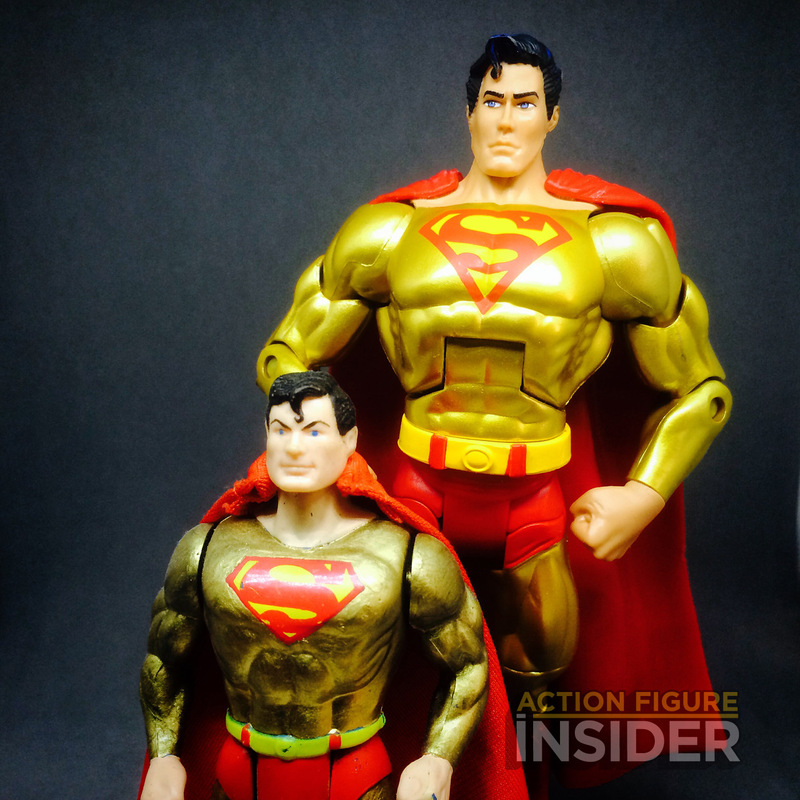 In it’s 7+ year run, Mattel’s DC Universe Classics has released 6″ versions of all 34 characters that were released in the 1984-1986 Kenner Super Powers line, however not all of the paint jobs on the Mattel figures matched their vintage counterparts. I think it’s important to note that these are merely a Super Powers tribute/homage and not a intended to be a replica in figure or card. There are quite a few differences in details on all of the cards and figures from their original Kenner release. That said it’s still a nice and fitting end that the line end with a tribute to it’s roots. 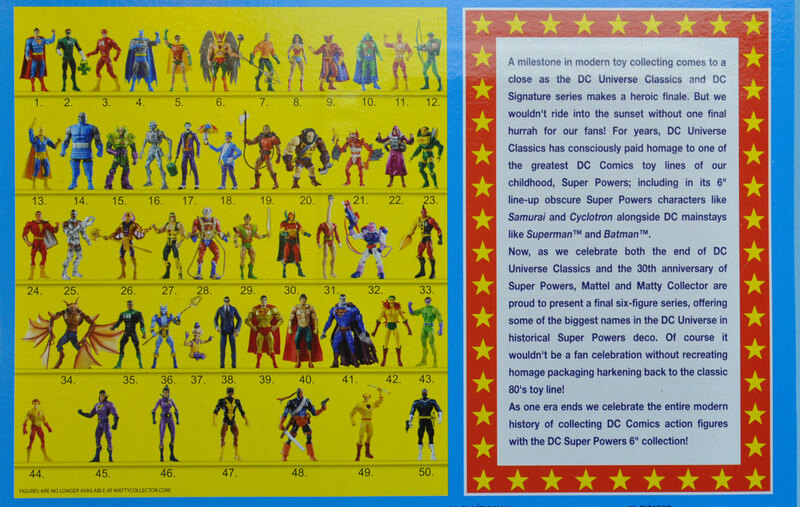 While some will argue that the DC Universe Classics line surpassed it’s predecessor in terms of “wow” factor, and certainly DCUC has far surpassed the Kenner line in terms of time and character selection, still all involved with the DCUC line were big fans of the original line and wanted to see it recognized as a blueprint to doing a great line of in the same style and in the same scale DC Comics action figures. 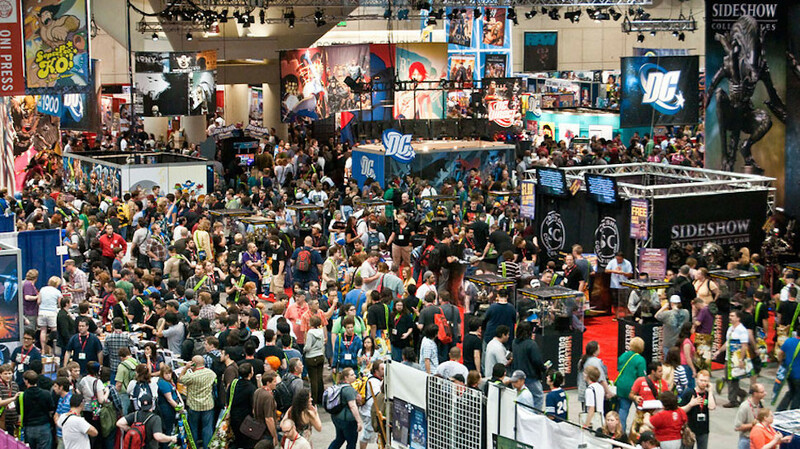 In 1988, DC Comics was due to celebrate the Man of Steel’s 50th Anniversary with a new series, a new movie, and other scattered odds and ends. Kenner was making plans in 1985 for this celebration, too. Mainly, there were planning on painting a bunch of existing items gold. 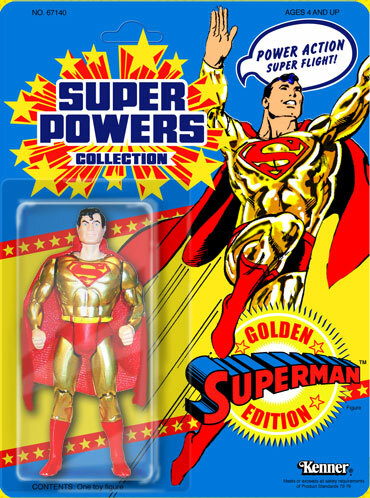 To start with, the basic superman figure would be re-released, possibly with new arms and a new “flying” action feature. The irony here is that Gold Kryptonite caused Superman to lose his powers. The mock-up of the card for this figure surfaced a short time ago (click on the link to see Michael Mensinger’s page about it), but nothing else was know until now. We can see that in addition to the figure above, they also were planning a golden collector’s case, much like the golden C-3PO case long featured in their Star Wars line. 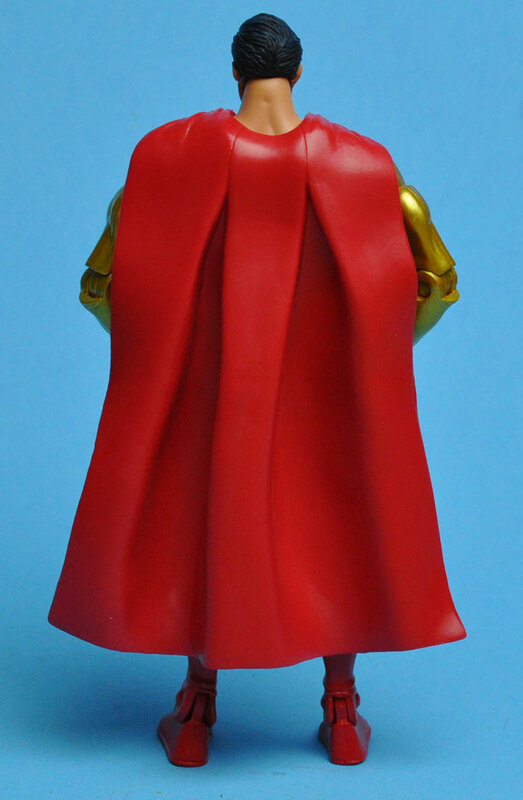 Kenner also planned a gold repaint of the existing Supermobile, which they made a mock-up of for the presentation. It’s safe to assume that the final products would be vac-metallized gold, not gold paint. 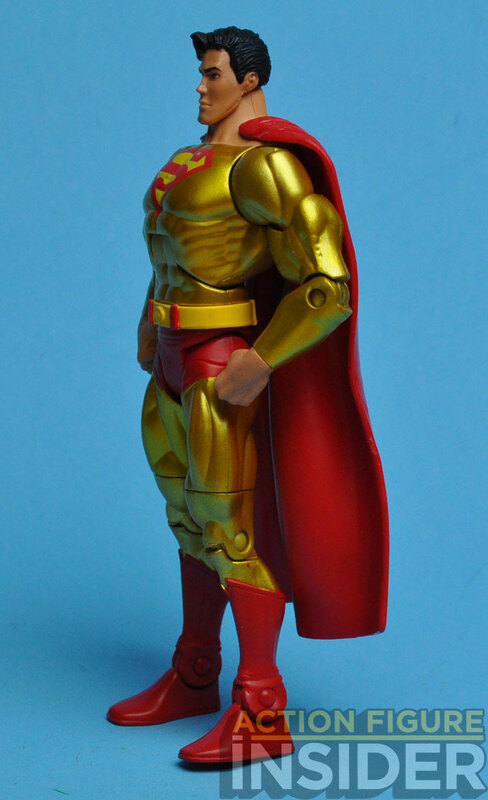 Basically, this is a chrome-like finish like that on the existing Brainiac and Cyborg figures. This process can only be achieved at the factory, so the mock-up pieces can only use paint to demonstrate the rough concept. I made a digital mock-up of what the carded figure might have looked like below, based upon the existing card mock-up and the concept art above. The card mock-up shows his shorts as being gold, also, but I went with the red as on the concept art. When Jason was originally writing the article on this figure back in 2004 he hand-drew the card for the mock-up for the feature. It looks like Mattel might have done the same thing using his mock up. Collect and Connect – The Collect and Connect Kalibak piece is in the mailer box not in the bubble with the figure. It is polly-bagged and taped to an “L” shaped piece of cardboard in the mailer box so that it’s not in the package with the figure, as that would not be accurate to it’s vintage counterpart. 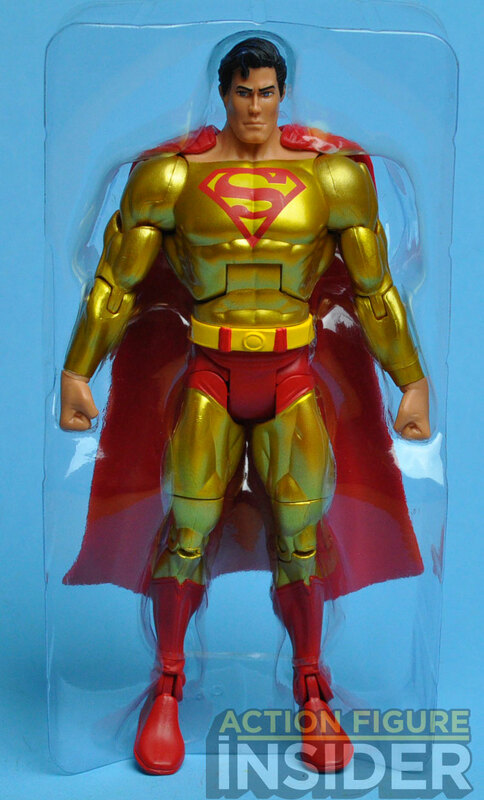 Gold Superman comes with Kalibak’s right leg. 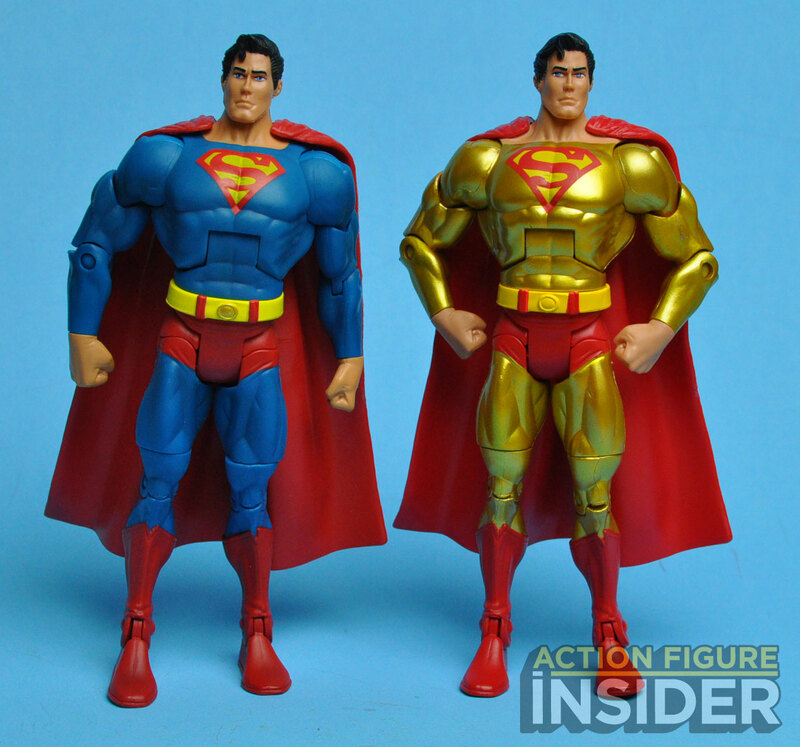 Comparison- Here’s Gold Superman next to the new Super Powers style Superman. 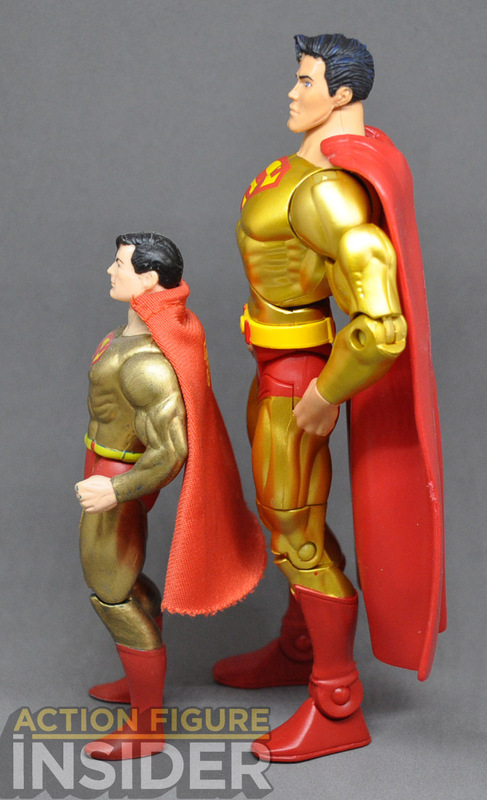 I have a custom Super Powers Gold Superman that I bought off Ebay many years ago, so here’s what he looks like next to that. This sample was provided by Mattel. I’m disappointed in this “Super Powers Goodbye” to DCUC. It exemplifies Mattel’s bungling and bad choices with this line. 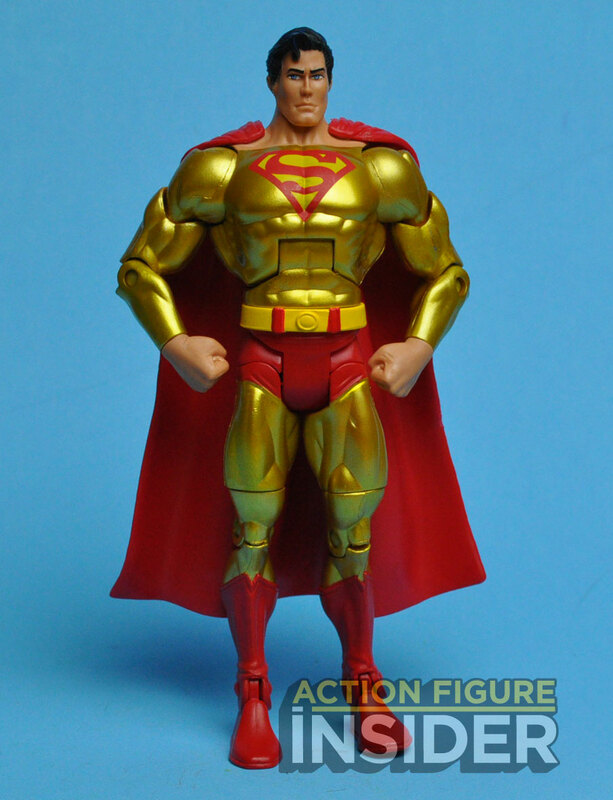 While tributes are nice and everyone wanted a proper light blue Superman that should have been released waves ago, Mattel seemed fixated on what Kenner did 30 years ago instead of charting its own path for DCUC. I’m a big fan of DCUC but I don’t care at all for yet another Batman or Wonder Woman figure that doesn’t improve or correct what came before. 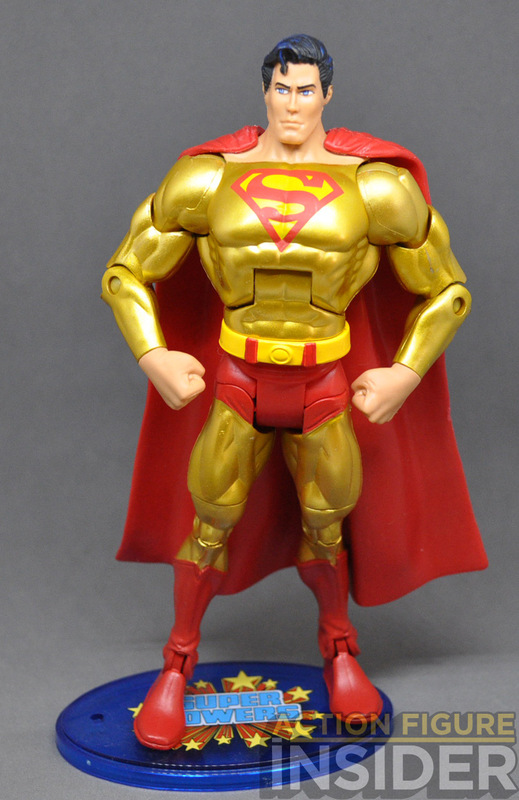 Unless you are a diehard Super Powers fan, did you really need or want a Gold Superman, re-decoed Kalibak or miscolored Green Lantern/Riddler to add to DCUC? 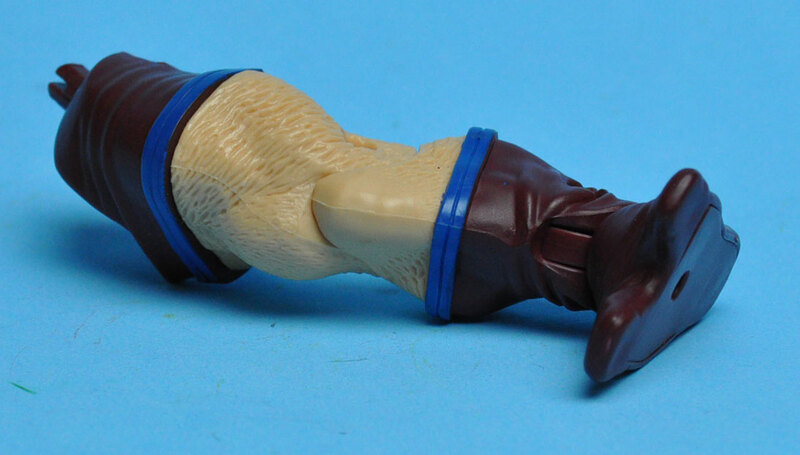 While the Mxyzptlk figure is new, it stinks in having him basically un-articulated and stuck in a seated position, especially at $30! A standing pose with at least 5 POA’s would’ve been the least they could’ve done. For the same tool-saving amount of money that it had cost to do this Super Powers retread, they could have created some new additional characters instead of repainting the same ones, and leave the fans & collectors that spent their money over the years on this line a proper send off. 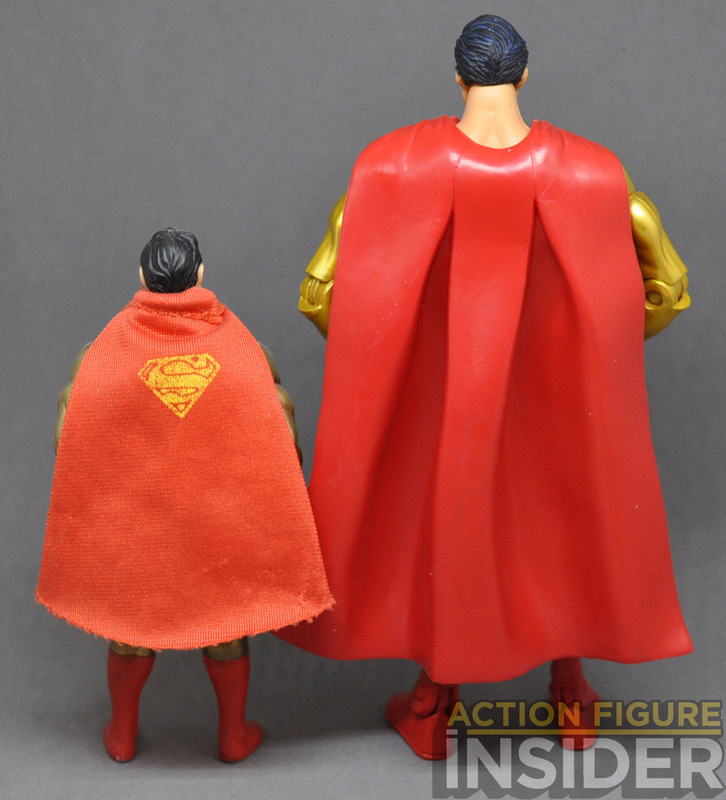 of all the figures mattel could have sent off the dcu with including paying some tribute to the super powers. they could have gone with another figure of the orignal line like maybe prof zoom or even like quadrax or sip in a granny goodness using kalibak mold. 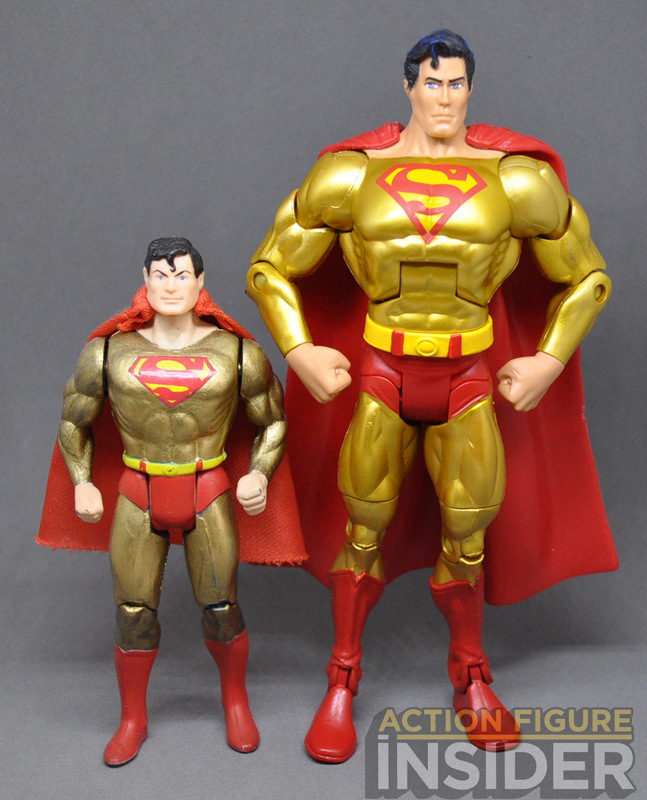 instead end the line with another batman wonder woman and super man in gold. even if it was suppose to be part of the line. though fans should be happy for some super powers lovers now have a chance at the legendary repainted green lantern as the riddler . but instead lets send the line we messed up handling with a gold super man instead of slipping one more requested character that the four horse man never had the chance to do . Totally agree with all of the above posters = Super Powers nostalgia strangled the life out of this line. I would argue this was achieved even before the line transitioned to subscription-only. 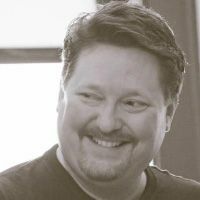 Mattel blamed us subscribers for the subscription’s failure, yet the dismal “Super Powers wave” seemed to have driven the line into subscription territory in the first place. (Lest we forget the onslaught of Cyclotron peg warmers.) In true fashion, the line ends with not another member of the Outsiders, nor with another member of Infinity Inc. A much requested Granny Goodness is nowhere in sight. No Ventriloquist in view. 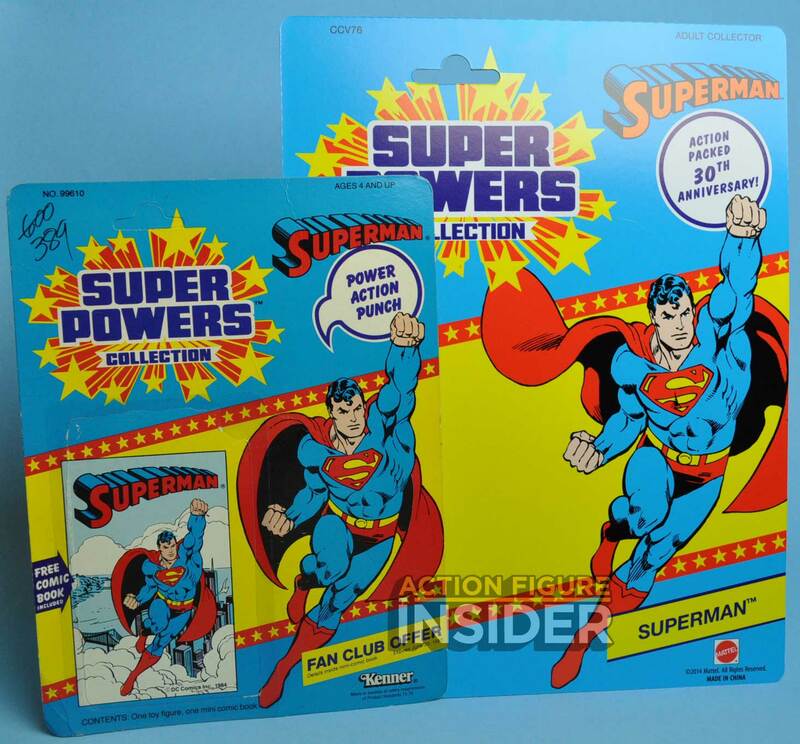 Instead, more Super Powers ephemera is being foisted on DC fans as some sort of consolation prize. In short: get real.